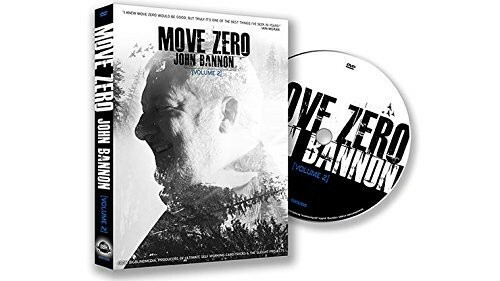 Move Zero (Vol 2) is the second in a series of four videos by John Bannon, in which he teams up with Big Blind Media to bring self-working magic to dazzling new heights. 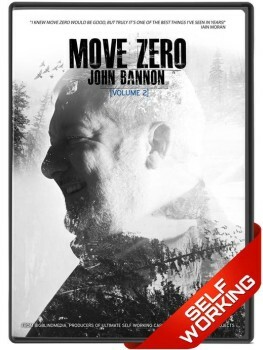 The ad copy makes the bold claim that "John Bannon's Move Zero is undoubtedly the most exciting study of self-working card magic this century." Self-working tricks often get a bad rap in card magic, and are typically considered the ugly step-sister of the pretty Cinderella known as sleight of hand, especially given their long association with tedious card counting, boring spelling tricks, and complex mathematical calculations. But when percolated through the clever mind of John Bannon, self-workers get a real caffeine kick. In this series of four brilliant DVDs, Bannon performs and teaches some genuinely mind-blowing magic. And even though there are zero moves, that doesn't stop John from constructing magic that is strong, surprising, and powerful. Despite the absence of sleights, gaffs, or gimmicks, you'll learn how to create strong routines with an ordinary deck of cards - often entirely impromptu. Volume 1 in this series received rave reviews, including a very positive review from me. And Volume 2 is a great follow-up, with another ten great tricks, along with more tips and advice from John Bannon. 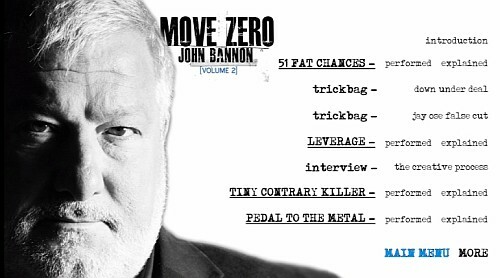 Available both as a DVD or as a digital download, and presented with the extremely high production values we've come to expect from Big Blind Media, Move Zero Volume 2 is another outstanding addition to the BBM line-up. This video can be purchased either as a DVD or as a digital download. The DVD (which I have) lets you view the entire video as a single play-through, or navigate directly to individual effects, trickbag sections, or interviews. There's a good mix of material, so it makes for pleasant watching to just let the video run and watch it through. Having this video available as a digital download is also a good option, especially if you want instant delivery. 1. Performances: The section for each trick begins with a live performance, where John Bannon performs for a range of different spectators. 2. Explanations: John next explains the trick to different BBM team members. Besides covering how to do the trick, along with suggested patter, he also gives valuable insight into the construction of strong magic by explaining why things are done in a certain way. The closing sequence for each explanation also gives a comprehensive list of all the credits. 3. Other material: Between the tricks, there are "trick-bag" sections that cover some of the principles and tools that good self-working tricks will use, as well as "interview" sections covering John's thoughts on a range of magic topics. To promote Move Zero Vol 2, Big Blind Media released the performance videos for two effects from the DVD, including what many consider to be one of the strongest, AK-47. This effect is presented as a bet, and John Bannon makes some helpful comments at the start of the video about how to use your patter to make your spectators realize that not everything you say is necessarily true, because this will make the "sucker bet" plot more entertaining. After cutting the deck, here the spectator gets 51 chances to turn over cards in a search for a named card - but remarkably the single card out of 52 that is not turned over at the end turns out to be the chosen card. Comment: This is a version of Open Prediction, or 51 Faces North. It's quite procedural, but in this case it's justified because the spectator does virtually all the card handling, and the presentation is that this is an opportunity for them to find a specific card. The first part of this effect is a rather unorthodox use of the Balducci/Cut Deeper Force, but in this case instead of forcing a card, the forced card is going to be the selected card which proves impossible for the spectator to find. A clever part of the next procedure - where all the hard work is done by the spectator - is that it actually helps disguise the initial procedure used to get the selected card out of play from the outset. But this strength is also a disadvantage - if the spectator knows you've seen the deck, they'll realize that they're just slowly working their way through the deck; so I'd advise starting with a false shuffle or cut, or even doing a glimpse after letting the spectator shuffle. The final phase employs the down under deal, which on its own isn't strong, but because this utilizes cards the spectator has selected, it makes the result seem more impossible. After the spectator shuffles the deck, you make a prediction, but then after watching the spectator do a practice cut with the cards you adjust it. The spectator then does a couple of cuts to reveal a face-up card, but when the prediction is revealed it is not the turned up card. Then you explain that after watching them do a practice cut you had to adjust it - and that's why you wrote down that it would be off by six. Sure enough, you count down six face down cards, and that IS the prediction! Comment: This is another routine that uses the Balducci Force, so the method is actually very straight-forward, but what elevates it above an easy to figure out or boring trick is the interesting presentation. As Bannon says, you are really "leveraging" (hence the name) a simple force. Having the spectator do an Ose Cut with the cards before moving to the revelation not only helps disguise what has happened previously, but also becomes a motive for the prediction being inexact - yet exactly the number of cards away from where they cut. This has a dual effect - firstly it makes it initially seem that you have failed, making the effect both interesting; and secondly it does a good job of covering your tracks. A very clever idea, and the fact that it can be done entirely impromptu with a borrowed deck is a real plus as well. 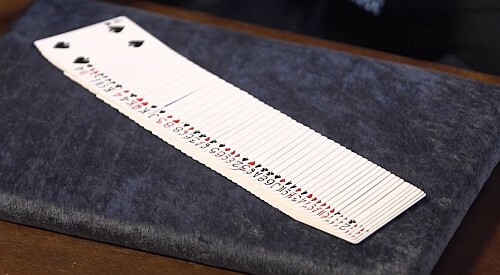 The performance here involves two spectators, the first cuts to choose a random card which is remembered and shuffled back into the deck by the spectator. Meanwhile the second spectator is asked to select a card that is as much as possible different from the card selected by the first spectator. Then follows a series of surprising revelations, starting with a revelation of the first selection from the deck. Then you produce a card wallet in which firstly you predicted that this card would be chosen, and secondly another prediction that matches the card merely thought of by the second spectator. Comment: Once again the Balducci Force is employed to good effect, and is the main engine driving the initial part of this trick. Having the spectator shuffle the card back into the deck, and getting a second spectator to merely think of a card mentally helps create a time gap before the revelation, which actually strengthens the force. The fact that the first card is shown as being predicted in a card wallet could suggest that it was forced all along, but that premise vanishes when the second card also proves to have been predicted as well, despite being merely thought of. Bannon's presentation in the first half of this routine is actually very clever, because it is used to mirror what is necessary for accomplishing the method in the second half (although I'd suggest mis-calling only by one, to parallel the procedure that can become necessary in the final phase). My only concern is that the "off by one" presentation could make the audience realize that you're using an "out". I'm not familiar with Kenton Knepper's "Kolossal Killer" that this routine is based on, as suggested by the "Killer" part of the name; the word "Tiny" refers to the fact that Bannon has simplified Knepper's original to use just two selections. The word "Contrary" implies a limiting of the number of "outs" by having a thought of card chosen by reference to the initial force card - a clever concept, although in my opinion it is used even more cleverly by Ryan Schlutz in his brilliant "Forget to Remember". The spectator apparently selects a random card which they shuffle thoroughly into the deck, and you then correctly produce. Now you remove a prediction card and have the spectator deal three hands of cards, which are then used to determine the colour, value, and suit of a card - which turns out to be an exact match for the prediction card! Comment: This feels like two tricks cobbled together, with the first phase using the Balducci Force as its engine to produce a simple revelation - oddly this is not even covered in the explanation, and seems unrelated to what happens next. The real trick is what happens next, which relies on the Matsuyama Petal Force to produce one of two words. I'm not a real fan of this force - especially because it is repeated three times, and since it relies on the down under deal, the forced result could make the self-working method too obvious. Not the strongest trick on the DVD, but there are people who really love it and think it is one of the best of the set! The Probability Cull can be used to do the set-up for this trick impromptu from a shuffled deck. The spectator selects three random cards for you. You then put the deck into two piles which the spectator pushes together to mix the deck, from which they select three cards. 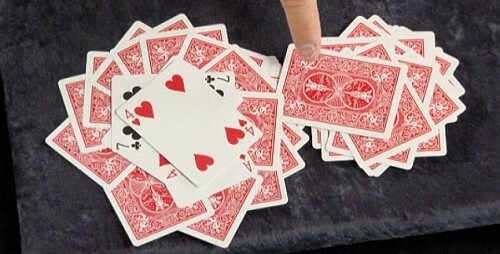 In a simple game of "high card", you each select a card from your hand of three, and get an exact match each time. As a twist, the three cards correspond exactly to a number you have written in advance on the back of the tuck box! Comment: The main concept here is about having two identical sets of three numbers being forced, but it is disguised by a series of simple shuffles and moves. Besides the Balducci Force, the method here relies on Gilbreath's Second Principle (which is a remarkable concept! ), which also gets additional treatment in the "Trickbag" section of the DVD. Having a game of "High Card" with the spectator to reveal three consecutive matches makes for a fun element. In his "Further Thoughts", John offers a great alternative for the finish where the three digit number corresponds to an actual lottery or raffle ticket - a wonderful idea which makes the final twist even more interesting and impressive. This trick is about time, requiring the spectator to remember a card corresponding to their favourite hour - which remains secret. They then cut the cards a number of times. You announce your favourite hour, and have them deal out cards corresponding to their hour plus yours. These are then reduced to a single card by a dealing process - which of course happens to be the card they have remembered! Comment: I quite liked how this effect came across in the performances, although I'm not a huge fan of all aspects of the method. Despite appearances this isn't like the traditional "clock" trick, because no cards are reversed or removed - it is actually more like a trick with a key-card. The set-up requires the use of a crimp, so this won't suit everyone. But I especially liked the final phase, which Bannon credits to Simon Aronson's Bluff Oracle, a type of Reverse Faro. In this three-act mini-drama, a spectator first chooses a card randomly from a stack that they cut themselves, and it is buried into the deck. After demonstrating what the spectator must do in their mind, you deal cards one at a time, and the spectator is to think "stop" when you have spelled out each letter of their selected card. Not only do you stop at the exact moment where they are thinking "stop", but the card you arrive at is in fact their selected card! Comment: This is a popular self-worker from Bannon's book Mr Fantasy, and even though it doesn't use any moves, it is cleverly engineered and constructed. You will need the breather crimp for cutting the cards, and a set-up that uses a stack of 26 cards which all have 12 or 13 letters. 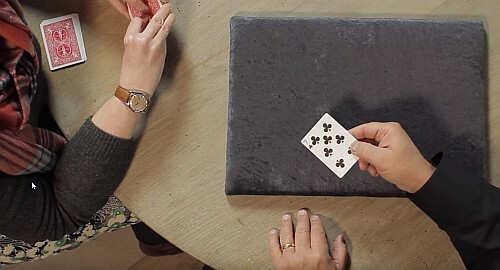 The best part of this trick is that the card you are holding in the end is their very card. This trick is very clever, very difficult to reverse engineer, and can generate some very strong reactions. John also explains how to do a quick reset, and offers a quick explanation for the method to help you remember it. The spectator merely thinks of any card in the deck, and they secretly deals off cards corresponding to its value from a shuffled deck. Now you take a card from the remainder of the deck, and ask the spectator to find their card in the deck. But they can't find it - it's the one card you've removed! Comment: In terms of the effect, it should be mentioned that this trick can result in an alternative out, where you produce the mate of their selected card. But the mechanics behind this trick are ingenious, which involves some clever use of a key card and some simple fishing to determine the colour. It's based on an Allan Kronzek routine, and also borrows from John Carey's excellent "Think and Sync" which is somewhat similar. Especially useful is how Bannon explains the thinking behind every element of the mechanics, and provides completely legitimate motivation for all your actions. The patter here is excellent, and is a superb example of Bannon's brilliance, where the outcome always looks like the intended result. An outstanding trick that is worth the effort required to familiarize yourself with the different outcomes, and perhaps the best on the DVD! After the spectator selects a random card, you divide the deck into four piles that you shuffle into each other face up and down to create an apparently jumbled mess. Now the spectator names the suit of their card, and you reveal that all the cards in the deck are face down except the cards of that suit - with one missing: their chosen card! Comment: This is one of Bannon's earliest card tricks, going back 30 years. It won't come as a surprise that this trick requires somewhat of a set-up, so it can't easily be done impromptu. Some humor also helps the presentation, and the result is something that feels genuinely magical and powerful. It's been around for a while, being first published in Bannon's book Impossibilia (1990), but it is also one of his best! Under the guise of a story about a gypsy fortune-teller who gave you some notes about a person you'd meet that day, two halves of the deck are first shuffled into each other. Three cards are selected, with the spectator making decisions about who gets them and whether or not they are face up or down. The position and identity of the three cards is then exactly as predicted on a note from your fortune-teller friend Esmerelda! Comment: The story and presentation really helps elevate this trick above average. There's some very clever thinking here (partly inspired by Corbuzier's "Free Will" - hence the related name "Free Willy") which takes care of several outcomes, and it's yet another excellent example of the clever thinking of John Bannon. In reality some simple forces are happening here, but they are completely disguised by the choices made by the spectator and masked by ambiguous dialogue. Not explained is the special shuffle used at the start of the performance to make things even more well hidden, but this is taught in the trickbag section as the "Remote Rosetta". Here is a performance of Matchismo, another trick taught on Move Zero Vol 2, and released to help promote the DVD. Like the AK-47 performance, it gives a good idea of John Bannon's style, as well as BBM's high production values. Down/Under Deal: This is a self-working procedure for turning up a selected card, and while a bit mathematical, it has the advantage of having everything happen in the spectator's hand. Jay Ose False Cut: This is a nice simple false cut using three stacks, and is easy to learn while being quite deceptive, because it looks like a triple cut. This false cut is already covered in Move Zero Volume 1, but it's good that it's included here, since it is a real workhorse move that is a good simple false cut to learn and use, and thereby strengthens a lot of the other material on the DVD. Probability Cull: Alan Ackerman's probability cull (used for the set-up of "Pedal to the Metal") relies on the fact that there will almost certainly be two cards of the same value adjacent to each other in a shuffled deck, and using this to set up the deck virtually impromptu to put together a four-of-a-kind. Gilbreath's Second Principle: This can make a self-working trick that relies on a group of three or four cards even more deceptive. It allows you to set up a deck so that a riffle-shuffle will never disturb your stack. It's a very powerful technique - although it requires the right trick, because it only works if the suit of the cards don't matter. Keycards and Crimps: Here John explains how to use a crimped card as a key card, which has the advantage of being able to cut to it no matter where it is in the deck. This is the method used behind the trick "Chronic" amongst others. The instruction covers how to make a bottom-cutting breather crimp, which is a handy utility device that you can cut to it easily, especially when used in combination with a corner crimp. You can even let a spectator cut the deck, and they'll often cut to the crimp without even trying. Stacking the Deck: Many self-workers rely on a full or partial stack (e.g. "Dead Reckoning" and "Bannon's Triumph") to do all the work for you; this brief section merely discusses the utility of stacks like these. Remote Rosetta: Sometimes you want to give the spectator the chance to do a single riffle shuffle without disturbing the order of the cards too much. The Remote Rosetta shuffle is an ideal way to let the spectator push two piles into each other, while still preserving a small top stack. This technique is used in the "Free Willy" performance. Content: Like Volume 1, this is a good collection of self-working tricks. Big Blind Media's aim with the Move Zero project was to make a collection of John Bannon's self-working magic, and they soon realized that he'd produced at least 40 such effects, all of which they considered to be strong and worth including. A number of the tricks are variations on similar themes, and rely on similar mechanics - in this case the Balducci Force. But despite the fact that there is some overlap in material, overall there's still a good spectrum of magic tricks, and the variations do enable you to select the tricks that you think works best for you, rather than including all of these into your repertoire. I especially liked 51 Fat Chances, Chronic, Dead Reckoning, AK47, Bannon Triumph, and Free Willy. Self-working: As John Bannon himself admits, the term self-working can be a misnomer, because every trick needs a good magician to present it well. Some of the tricks taught do require some set-up, although the majority can be performed impromptu. But it's fair to say that what we have here is a collection of genuine self-workers, that rely on cleverness, psychology, and subtleness, and where everything is openly performed, rather than on secret sleights. Difficulty: Because all the tricks in this collection are self-working, they are well within the scope of beginners to learn. That doesn't mean that the quality of the magic itself is inferior. There's some fine examples of strong magic included here, even though the level of difficulty in learning the tricks is not high. They are relatively easy to perform overall as well. Yet while there is excellent material here that beginners can perform, experienced performers will also find top notch magic that will satisfy them as well. Powerful: Self-working doesn't mean weak magic. So don't dismiss this collection just because no sleights are used. There are still some top notch card tricks included, and when performed well they can really produce a big impact. And you certainly can modify some of these tricks to introduce sleights if you think that makes them stronger, e.g. by replacing some of Bannon's self-working forces with your favourite force. Psychology: I really appreciate the presentation and patter that John Banner uses. Much of it is very subtle, reinforcing certain ideas that need to be important in the mind of the spectator; he does this very effectively, and it can make all the difference in performing a trick successfully. 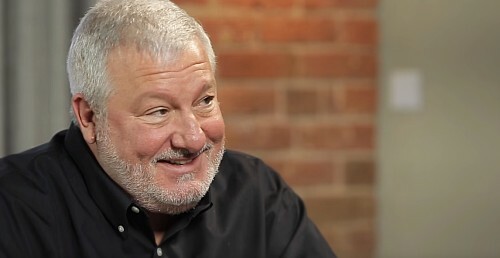 John Bannon really knows how to present these tricks well to maximize their impact, and a great deal can be learned from his performances about how to avoid turning these into boring counting tricks. Behind much of his patter are very deliberate choices that emphasize psychological principles, and this kind of thinking is key to being a good magician. Explanations: The teaching section consists of a dialogue that John has with various BBM personnel, and has the feel of a personal sit-down session with a magician. Bannon has the ability to explain things carefully and slowly, so there's no difficulty whatsoever in learning the tricks based on his instruction. But there's much more value to the teaching sections than just learning the method behind the effect in question, because along the way there are many moments of useful discussion that John has with his fellow magician about why he takes the approach he does. So there's a lot of valuable advice and tips that he passes on that have application beyond the trick you're learning, and which you can apply to other routines. Teaching: One thing I really appreciate about this series is that in addition to the routines that are taught, there are extras like interviews and advice. 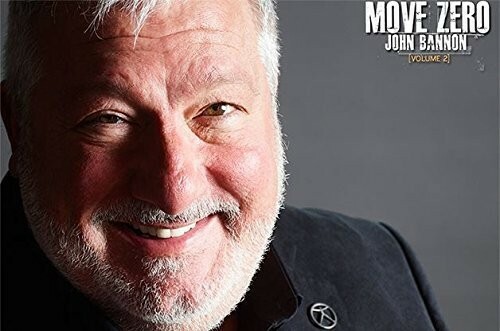 The BBM team knows that John Bannon is highly respected for his understanding about the psychology of magic,and so they've found ways to have him de-construct his methods and share his thought process with us. This will help you develop your own thinking about magic, make us think more maturely about key aspects of magic, and so learn how to craft routines that are genuinely powerful. Utility Moves: The "Trickbag" sections of the video cover some of the techniques that are foundational to self-working card magic. In these sections Bannon covers things like the Balducci Force, Jay Ose False Cut, and Breather Crimp - all useful tools in the right situation. The Trickbag sections do repeat some material already included under the teaching of specific tricks, but I don't think this duplication matters, because it means that you'll learn all you need to know in the explanation of the trick, or you can access the teaching material on a move independently. Interviews: In these sections of the video, John Bannon shares his thoughts in response to questions on topics like his typical process in how he goes about creating new magic, his favourite moves (the Bullet Count - although he tends to prefer trick construction rather than technique), and what have been major inspirations for his magic. I especially enjoyed his emphasis on needing to understand what you like in magic and being able to articulate why, so that you can be selective and critical in your reading. He also gives a hint about his plans for a retrospective collection that covers all his work, to be entitled Cardzilla. But in his own words, he's not dead yet, and first he has some more tricks up his sleeve for further magic releases! Production values: The stellar production of this video is immediately evident with the video case, which features a professionally produced graphic design as the cover artwork, and on the back a list and overview of the contents. The production quality is absolutely outstanding in every respect, and it is hard to think of magic videos that have higher production values that ones like these from BBM. The filming has been done in a studio, and the lighting and camera work is terrific. Multiple camera angles are used, along with panning and close-ups. A montage of images helps retain interest during longer sections of monologue and commentary from Bannon. At times music has been used to good effect to set a background mood. Everything about the video has been put together extremely well, and Big Blind Media deserves major kudos for their excellent work in producing such a high quality product. "Took away 3-4 amazing tricks that I'm performing regularly. Definitely worth getting." - Jason S.
"Simply amazing. Efficient, and at times hilarious, Bannon never fails to deliver. Hearing his thoughts on the trick bags always gives a fresh and practical insight. Quintessential Bannon." - Christopher C.
"The effects are great. 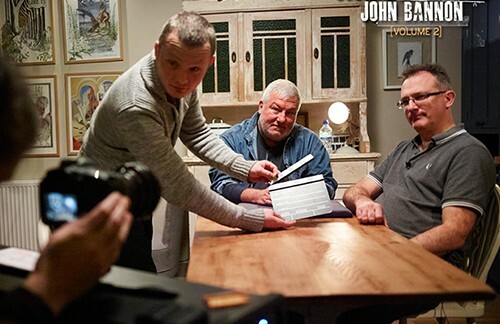 The insights into John's thinking are gold! " - Tony D.
"I've read the tricks in some of his books but it's great to see him perform and explain them." - John D.
"I loved Volume 1, but Volume 2 is even better. Over 2 hours of solid magic and tips." - Marv L.
Why should you be interested in another video dedicated to self-working card magic? Well, this isn't your ordinary self-working magic and doesn't stoop to the level of mathematical atrocities. The Move Zero series offers top quality material that is well constructed and thoughtful, and which really capitalizes on important principles of magic. While being relatively easy to perform, these tricks still have the potential to produce real miracles for your spectator. John Bannon has a real gift in understanding the important psychological aspects of magic that can really strengthen a routine, and there's a great deal that can be learned from his clever and intelligent approach to the subtleties of magic. From a technical and production point of view, the video itself is outstanding. In almost every respect, Big Blind Media has raised the bar for a quality magic video, and it's difficult to think how a superb production like this could be improved. Combined with strong material from a top notch and clever magic thinker like John Bannon, they have created a real winner with Move Zero. And Volume 2 is every bit as good as Volume 1. Congratulations all round, and highly recommended!